This is one of the first images of Old Oak Common station in west London. A decade from now, this should be the country's busiest rail hub. This piece offers a brief, jargon-free introduction to the project, with images of how the station will look, and how work is already progressing. We won't be going into the controversies and politics of the project on this occasion. HS2 is the under-construction fast rail link between London and Birmingham and the north. It will start from Euston station and pass through Old Oak Common in west London — an obscure part of town, though not for much longer. Image by Cnbrb under creative commons licence. Click for larger image. 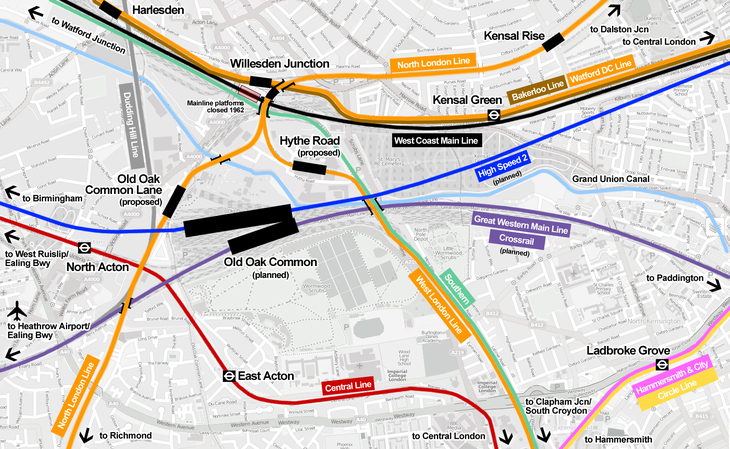 As you can see from the blue and purple routes, Old Oak Common is where High Speed 2 (HS2) will hook up with Crossrail and the Great Western mainline (including Heathrow Express), to create the busiest interchange in the country. Two proposed Overground stations, off-site but close by, would add to the frenetic thrum of the place. The new plans (above) show how the lines will knit together. A stylish glass and steel canopy will combine the various rail routes into one hub. 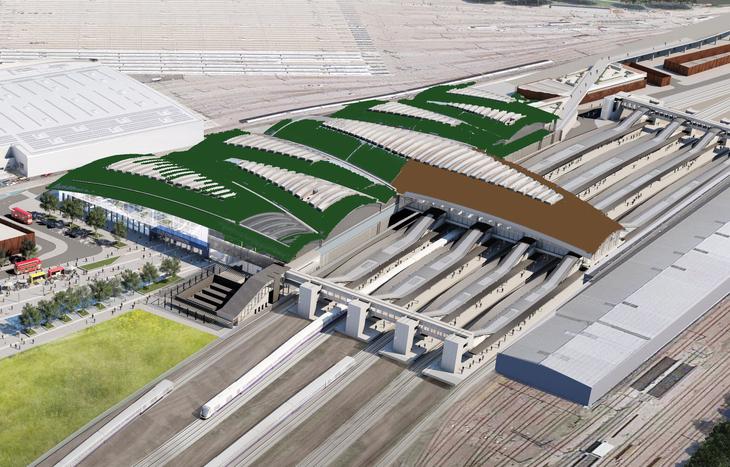 The subterranean HS2 platforms will be housed beneath the main grey and blue section, while the Great Western and Heathrow services will use the adjacent platforms. 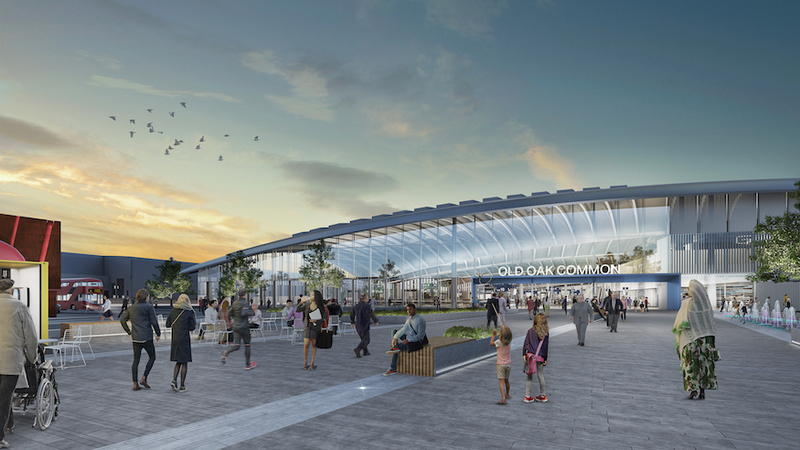 Unofficial, badly doctored image showing how we'd colour a station called Old Oak Common if we were in charge. We recently took a tour of the site, to get a feel for the place before the changes bite. 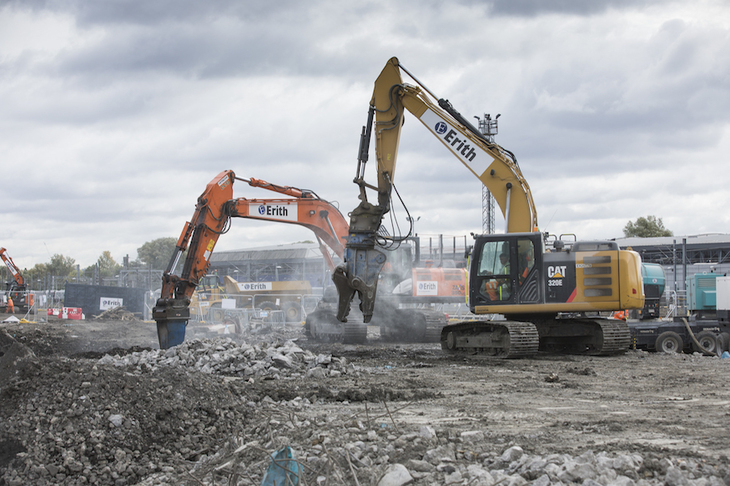 It's a land in flux: a whirl of excavators, dump trucks, surveyors and noise; half-deleted depots mingle with the ghosts of infrastructure yet to come. 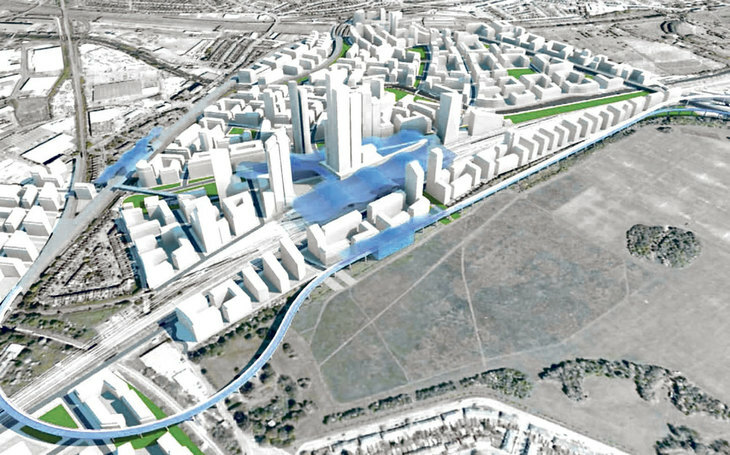 Less poetically, Old Oak Common is a massive plot of brownfield land the size of Hyde Park. 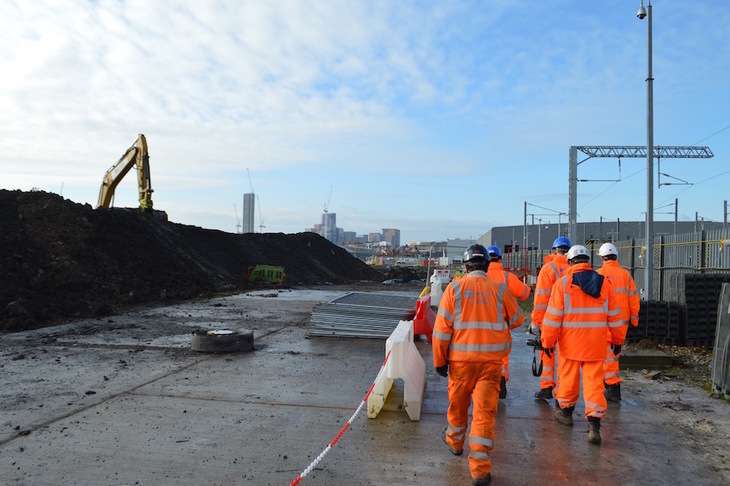 HS2 contractors are already on site, clearing old railway gubbins, cleaning the soil and getting ready for construction. Site prep is well underway. They also have snazzy high-vis jackets. Image by M@. The next stage will see the excavation of the station box. A vast canyon must be gouged through the landscape to accommodate the subterranean HS2 lines. We're talking a trench that stretches for a kilometre, and that reaches 60 metres wide and 20 m deep. It will be one of the largest underground structures in the world, so we're told. Most of this is going to be gouged out. Image by M@. 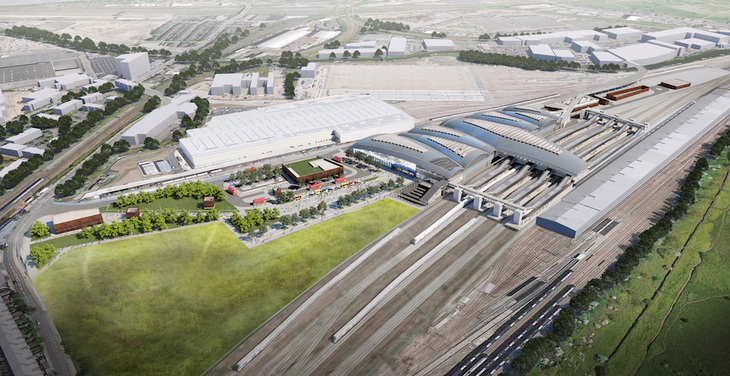 The HS2 platforms will eventually stretch 450 metres, much longer than a Crossrail platform. 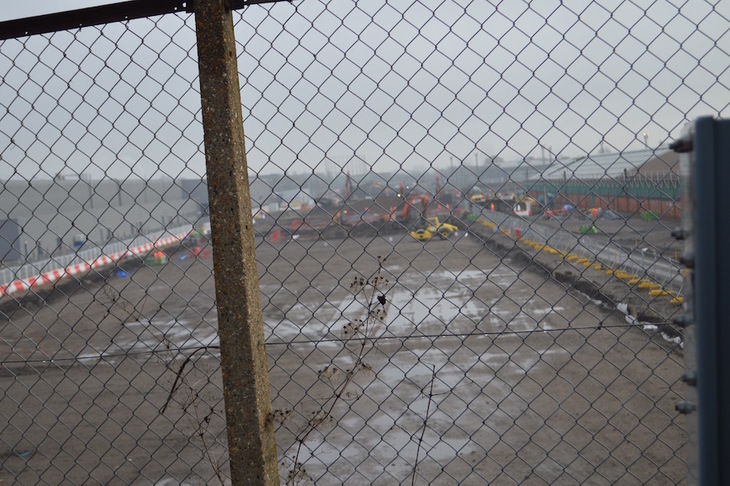 Speaking of which, the site sits close up against the Crossrail depot. 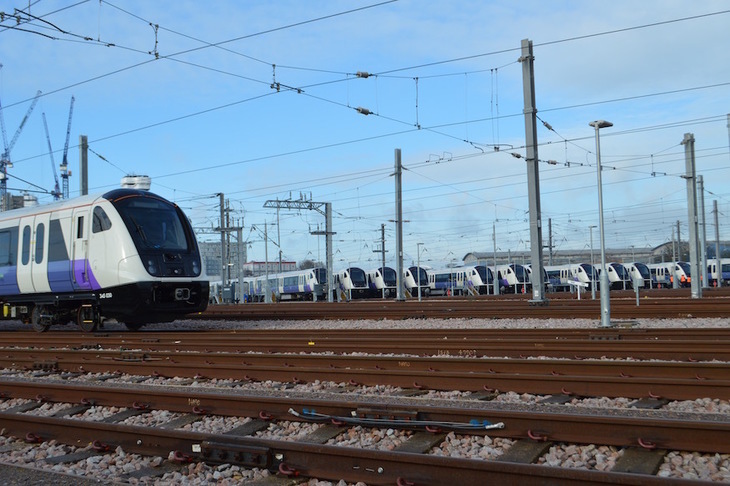 Through the fence, Elizabeth line trains sit forlornly. They should be carrying passengers by now, but must wait out another year, at least. 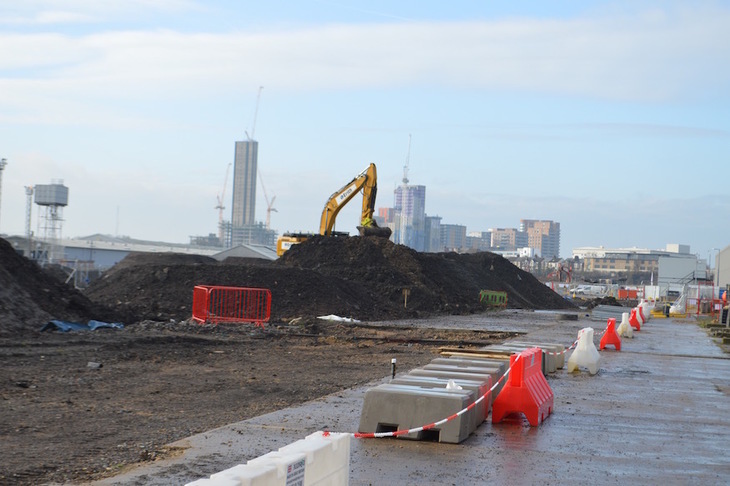 Old Oak Common is tipped as a key location for house building. Or, rather, flat building. Along with neighbouring Park Royal, the area will see some 25,000 new homes built over the next few decades. The process has already begun. There are hints of this in the emerging skyline. 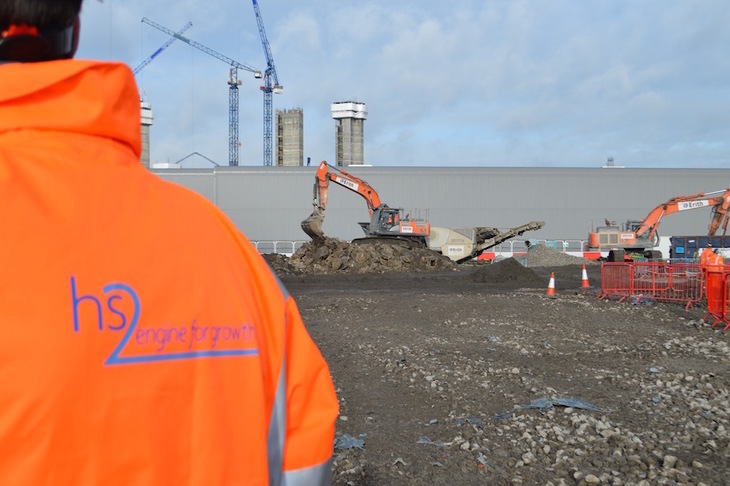 A project the size of Old Oak Common needs plenty of storage space. Step forward the old Willesden Euroterminal. 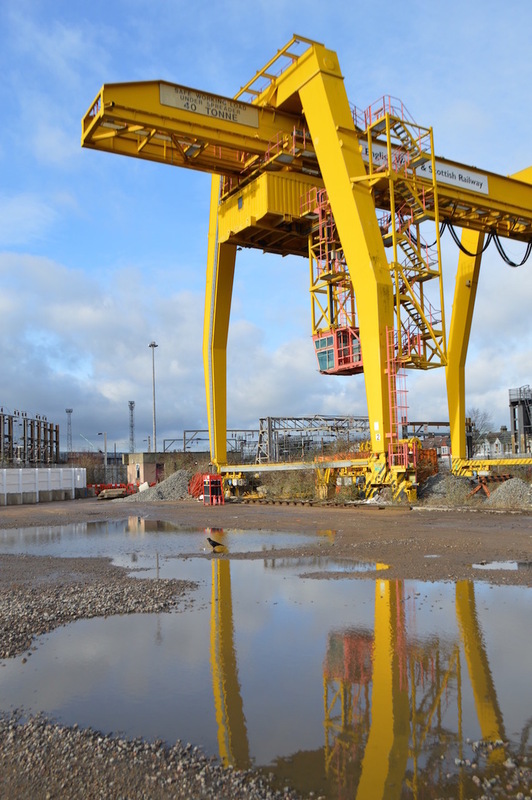 You might not have heard of this forgotten freight depot, but you've probably seen its mighty yellow cranes if you've passed through this part of north London. When the channel tunnel first opened, most freight trains to Europe were loaded with cargo on this site. The business never really took off, alas, and the terminal closed in 2005. It's been home to small businesses ever since. Now, the land has been acquired by HS2. 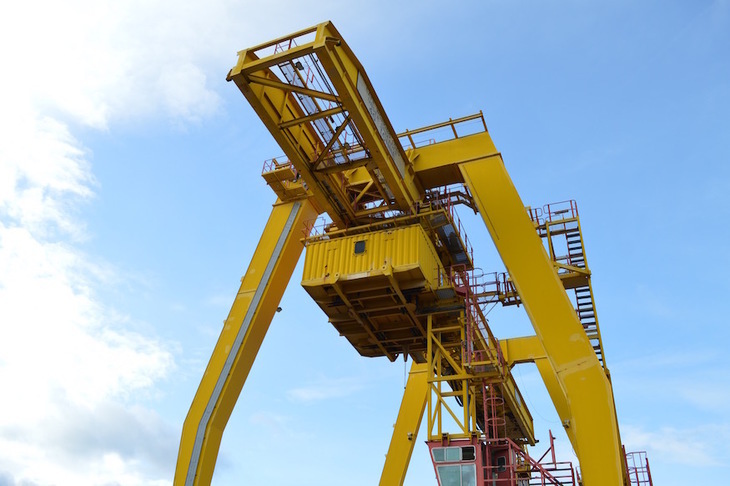 It will be used for logistics, such as storage of materials during the Old Oak Common project down the road. 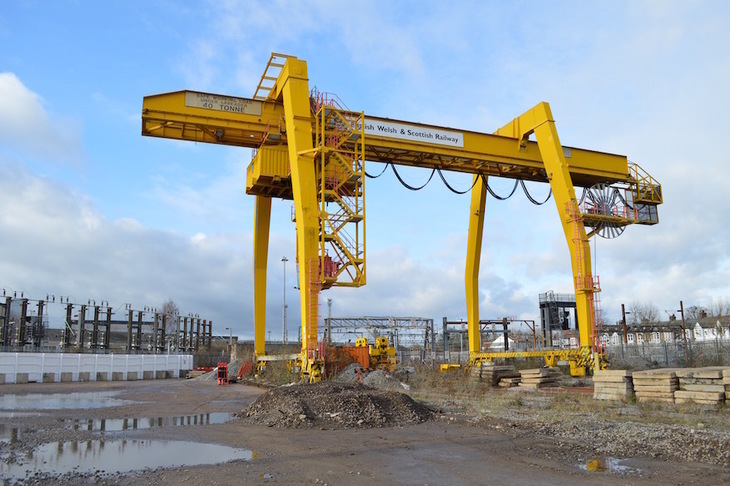 To make room for HS2 activities, the landmark cranes are currently being dismantled for scrap. Just one will be saved for posterity (and because its demolition next to live railway tracks would be problematic and costly). Twenty years hence, this leggy beast will no doubt be a luxury apartment with 'unique industrial heritage features'. It will certainly have good rail connections. See also our tour of the HS2 works at Euston. Have You Seen These Remnants Of A Failed Eurotunnel Project?